January: A training visit of some Keur Bakar Diahité representatives was made to the eco­village of Ndem and to Diol Kadd's reception unit. After the second year of cultivation of Takku Liggey women's cooperative biological vegetable garden, the results are promising. February – March: The building of the first Reception Unit was under way. The unit consists of three rooms (to host visitors), a toilet and a shower facility, plus a shed. 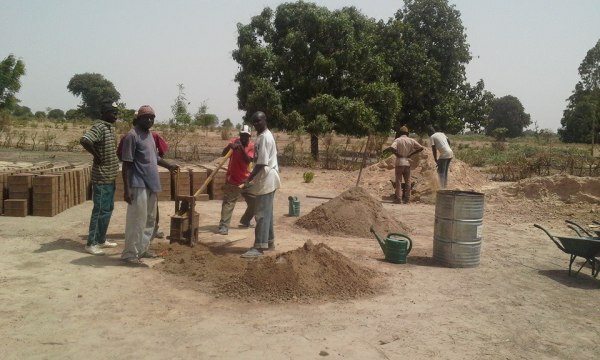 March – May: In the new cooperative Fass, young people were taught how to make stabilized soil bricks. They produced a total of 12,000. June: In Dakar Musoco Onlus (non­profit org. 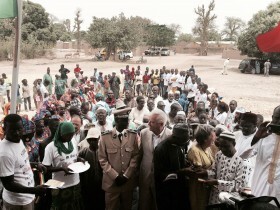 ), Senegalese NGO Union Pour la Solidarité et l'Entreaide, TAMassociates architects, and BAU (Bureau d'Architecture et d'Urbanisme) signed a contract for the construction of an eco­community house. A joint mission met the villagers. Maintanance of Takku cooperative's mill for grinding millet was carried out. July: The village chief and some women took part in the annual Pire award's ceremony for the girls' best school results (a Parma Mani project in collaboration with Musoco). August: The Belgian brick press arrived to be used to stabilize soil bricks and tiles for the young builder cooperative Fass Jom. August – October: Work stopped due to the rainy season. Contractual agreements were finalized and the eco-­house drawings and plans were sent to BAU. November: Following their parents' request, some Keur Bakar Diahité children started attendance at an elementary school in a nearby village for the first time. Some village women also attended a literary course promoted by Musoco and MANI onlus. November – December: New seeds arrived from Italy and the women's community vegetable garden re­started. In the building yard, foundations and a large rain water cistern were dug with pickaxes and shovels. After Christmas, a group of Italian eco-tourists brought some tools to work the land and a hand pump to utilize rain water from the well for the vegetable garden. MUSOCO is a non-profit organization (ONLUS) aimed at promoting dialogue among different cultures and sustainable development in Italy and abroad. Its social principles are MUtuality, SOlidarity and COoperation. Monday, July 20th – 2015. CAAF (Authorised Tax Assistance) North East: Since 1999 we have been donating 0.50% of our profit to solidarity projects, plus 50 cents for each citizen who has used our services. We have been financing mostly vocational secondary schools, hospitals, wells, and silos. So far we have collected 2,400,000 euros. We decided to finance H2OS because it is the future. It is better to give a fishing net than a fish! 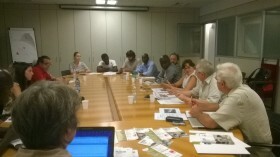 Cgil (Italian Confederation of Labour – Trade Union): We wish to speak about foreigners in Italy in a different way from how it has been done lately, by offering our energy and knowledge to help poorer countries. Tamassociati Firm: Guided by social principles, we also work in different countries abroad for NGO Emergency. We build dwellings compatible with the natural environment and tailored to local citizens. The idea of HO2S was formed in Senegal, not here in Italy. Our mutual aim is to help create conditions for dignified lives. In order to plan the Ecological House we have met 15 times at the CGL centre. It has been a fruitful participatory process with Senegalese immigrants. At the heart of this prototype dwelling is the incorporation and management of water, a current issue for Africa but also elsewhere. Our prototype will be a useful model both here and beyond Europe to test techiques for collecting, conserving and using water in a responsible way. The basic services of the home will be placed at the technological head, the rest will be DIY. As a technology meant for community housing, its focus is to create local jobs and to provide villagers with knowledge, such as how to make bricks with stabilized soil. From the hundreds of projects submitted, the Foundation Autodesk selected and financed ours, among four others, because of its innovation. Sunugal: We wondered how we could contribute to the development of our country while being in Italy. Our migration is circular, and our plan is to eventually go back and settle in our homeland. After having provided for our families with remittance money, we will then invest in a house. Poverty cannot be eliminated in the world, but we can do our part to help alleviate it. Thinking of others as our fellow creatures also helps us to grow culturally. People must grow together. For this reason we wish to take Italians to Senegal with us. Do Community: We intend both to promote sustainable tourism as a form of microentrepreneurship and to support the village of Keur Bakar as part of a Senegalese network of eco villages. 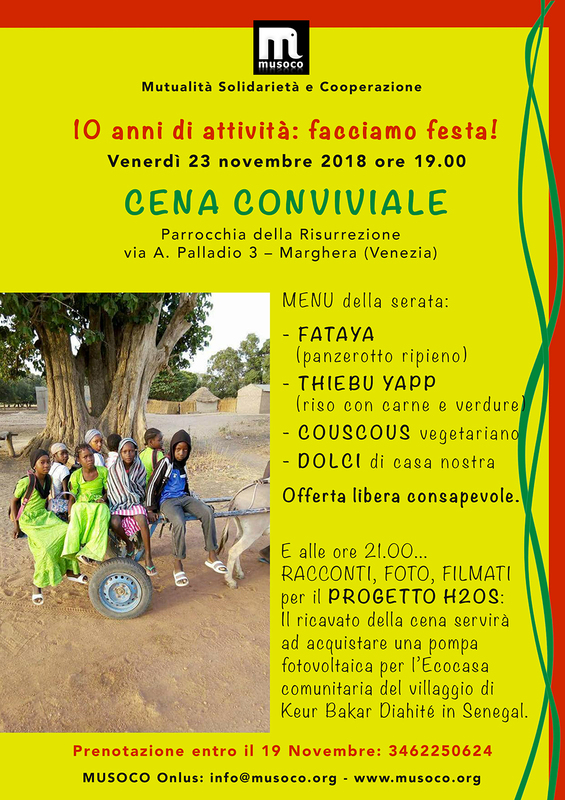 The ecological challenge both here in Italy and in Senegal is also a cultural challenge. Tamassociati Firm: The heart of the project is a technological head. There will also be a cistern with pumps which will favour a sensible use of water. Waste water will be recovered and recycled with light phytoremediation methods. An underground tank will keep the building cool, thereby improving villagers' quality of life. With the help of vocational Secondary School Zuccante in Venice we will experiment with a series of water meters to check on daily consumption. source for others. The ecological housedry bath is already open source technology, and our idea is to launch this world wide. 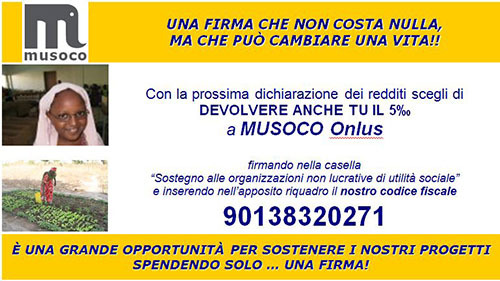 MUSOCO Onlus: In 2013 we created a partnership for the project. 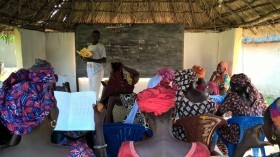 In Senegal our partner is USE (Union pour la Solidarité et l'Entraide). Our eco-sustainable house is intended to be available for all, not just for the wealthy. Because of this value, we offer our professional knowledge at no cost. A month ago we signed contracts. USE will deal with the finances. Now that all the conditions are met to start construction we envisage completing the project at the beginning of 2016. Because the average price of a quality house in Senegal is 18,000 US dollars, we intend to contain our costs according to the market by having the construction company begin work on the technological head only. The rest of the work will be carried out by local villagers. The Community Eco-house will serve as a Civic Centre. Because it will be three times larger than a family house, it will cost three times more. The village: In Keur Bakar we have neither running water nor a school. With this project we have brought a millet seeds mill to alleviate women's work. Since then a women's cooperative has started to cultivate a biological vegetable garden. The men's cooperative has already produced 12,000 bricks of stabilized earth. We are motivated.